Woodbridge, United States - April 17, 2019 /MarketersMedia/ — With the recent debut of Surviveware’s Travel-Sized Biodegradable Wet Wipes, the company is pleased to announce that their newest product has consistently gained 5/5 star reviews from customers. These handy wipes are showing their full potential as a must-have product for outdoorsy and on-the-go individuals. BuzzFeed’s favorite wet wipes were given a twist through their new travel-sized packaging, to cater to the need of hiking and camping enthusiasts for a portable hygiene product that is lightweight and compact. 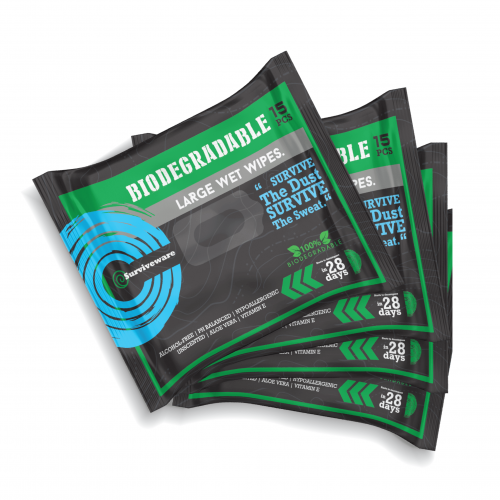 Surviveware’s Travel Biodegradable Wet Wipes are perfect for those who like to carry the solution to their hygiene woes in a tiny pack in their pocket. These travel wipes are made from soft cloth material that begins to decompose within 28 days after use. Since these wipes are designed for campers and hikers who go on trips in the backcountry, Surviveware ensured that the wipes will disintegrate and won’t pollute the environment. Despite its smooth glide on one’s skin, the sheets are durable and won’t easily tear during use. Aside from its durability, Surviveware’s Wet Wipes feature a hypoallergenic and fragrance-free formulation. Each sheet is infused with natural aloe and vitamin E extracts that keep the skin supple and nourished. The wipes are free from alcohol that may cause dry skin and irritation. Moreover, Surviveware ensured that no harmful chemicals are included in its formulation. Those with sensitive skin can freely use this product without worrying about allergies and irritation. Surviveware’s Travel-Sized Wet Wipes come in a 4-pack, each containing 15 moisture-enriched sheets, ideal for on-the-go situations, last-minute adventures, and rugged sojourns..
Order Surviveware’s Travel-Sized Biodegradable Wet Wipes in a newly convenient and handy size. Grab this 4-pack today and enjoy feeling fresh after all your adventures. Order your pack today by clicking here.